FSY Architects is pleased to announce that Teague Terrace, a LEED Platinum affordable housing apartment complex, has been selected for inclusion in this year’s Greenbuild program in Los Angeles. 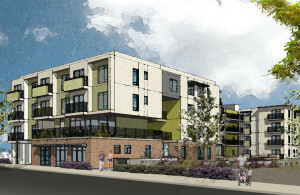 The 56-unit affordable housing apartment complex for Veterans, Developmentally Disabled and Senior Citizens is located in the Eagle Rock neighborhood of Los Angeles, and is planned as an educational tour following the 3-day Greenbuild conference at the Los Angeles Convention Center. Greenbuild is the world’s largest conference and expo dedicated to green building, and features three days of inspiring speakers, industry showcases, LEED workshops and tours of the host city’s green buildings. The Teague Terrace educational tour is scheduled for Saturday, October 8, 2016, 1:00pm – 5:00 pm. Additional conference information is available at www.greenbuildexpo.com.